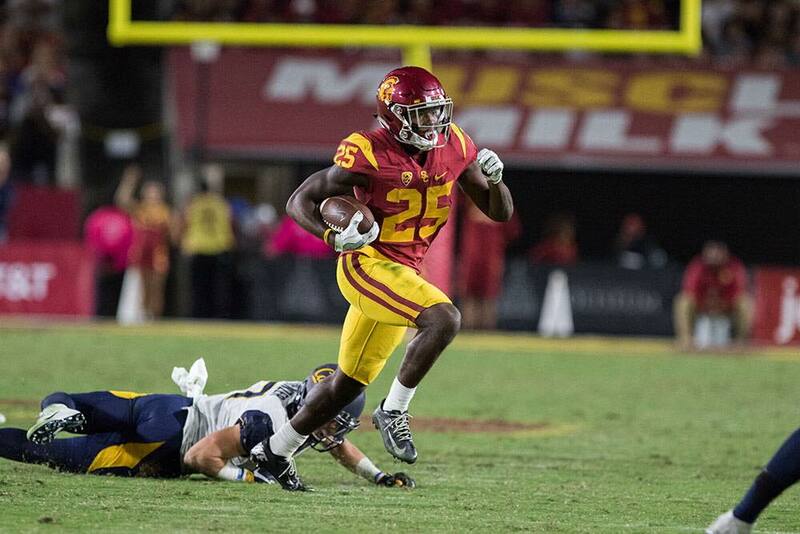 Junior running back Ronald Jones II declared for the NFL Draft Friday morning, just two days after redshirt sophomore quarterback Sam Darnold declared for the draft. “Because of the prayers, love and support of so many people, I feel I am genuinely ready for the challenges and successes of the NFL.” Jones said in a letter announcing his departure. Jones arrived at USC by way of McKinney, Tex., in 2015 and made his presence felt immediately. He led the team with 987 rushing yards — the most ever for a freshman in school history. Affectionately referred to as the “Texas Tesla,” the speedster upped the ante in his sophomore year, eclipsing the 1,000-yard mark and earning All- Pac-12 second team honors. In his third and final campaign, a bulked-up Jones rumbled for 1,550 yards, with 19 touchdowns making first team All- Pac-12, alongside Darnold. Jones ran for over 100 yards on nine occasions this season, including a 216-yard performance against Cal and a 140-yard game in the Pac-12 Championship. Always a home run threat during his career with the Trojans, “Rojo” finishes his career as the fifth all-time rusher in USC history. He is currently projected to be a second-round pick by many draft analysts.